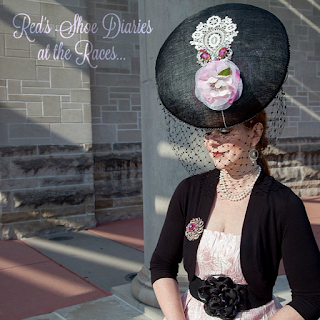 This year marked my 7th visit to Churchill Downs for the Kentucky Oaks. Sponsored by Swiss watchmaker Longines, the Oaks is a high stakes filly race held on the Friday before the Derby. Having now participated in both Oaks and Derby Days for several years now, I can say that, for me, Oaks Day is my favorite of the two. Maybe it's because there is so much anticipation at the beginning of a full and fabulous weekend; maybe it's because everyone and everything feels fresh and new on Oaks Day; maybe it's because it's a bit less crowded (though not much); or maybe, just maybe, it's because everything is a color-coordinated sea of pinks in every hue (think "blush" and "bashful" for those Steel Magnolias fans out there). This year, even the jockeys wore pink pants. 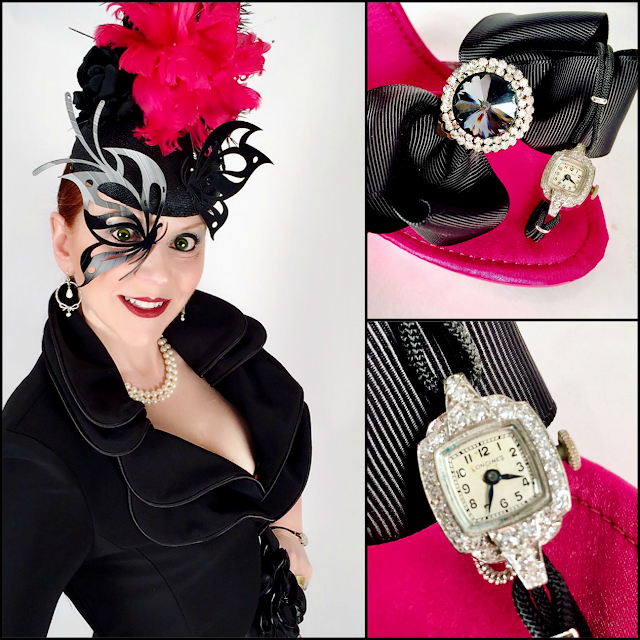 The wire-collared bolero is from Joseph Ribkoff; I added custom clips to my pink shoes using children's hair bows and a pair of clip-on earrings; The 1940s platinum and diamond watch is by Longines, which felt particularly appropriate since the Swiss watchmaker sponsors the Kentucky Oaks. 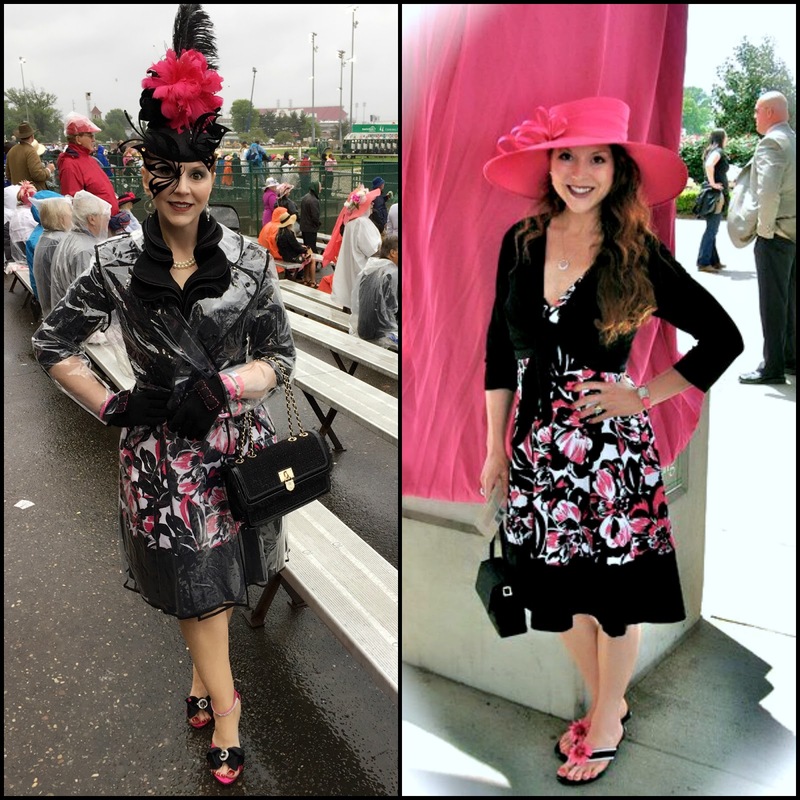 You can wear any color you'd like for Oaks Day, as long as it's pink. I always pay special attention to my Oaks Day ensemble. Redheads have to choose their pinks carefully, after all. This year, I was particularly looking forward to wearing a striking bespoke chapeau that was handcrafted to match a dress I'd yet to wear (I was saving it just for Oaks Day). But, on Wednesday afternoon, I learned that the forecast for Friday was grim - 100% chance of rain and a high of 52 degrees. It had never rained on my personal Oaks Day parade before, and it's never been anywhere near that chilly. I was bummed, and when the weather predictions did not improve thereafter, I decided it was too risky to wear the new hat, which has some very delicate and antique elements. 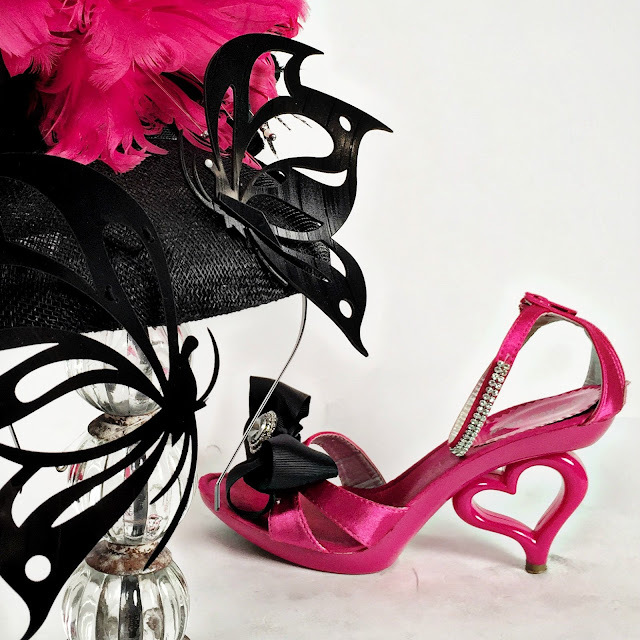 The delicate black butterflies are laser cut from old vinyl records; The heart-heeled shoes were an inexpensive Amazon find that are as comfortable to wear as wedges, though I did change into wellies for the muddy walk to and from the track. I lost count of the number of people who stopped me to ask about my clear raincoat which is styled like a classic trench coat with black fabric seamed details and a belt. It, too, was an inexpensive Amazon Prime find. This butterfly hat began life as a striking but simple creation from Marge Lilane (see it's original incarnation here). The butterflies themselves are laser cut from old records, and while you might think the one that sits over my right eye would impair my vision, its strategic placement allows a clear line of sight (much better, in fact, than wide brimmed hats with a dramatic tilt that completely obscure peripheral vision on one side). Simple pearl jewelry offsets the heaviness of the dramatic black collar and the butterflies. 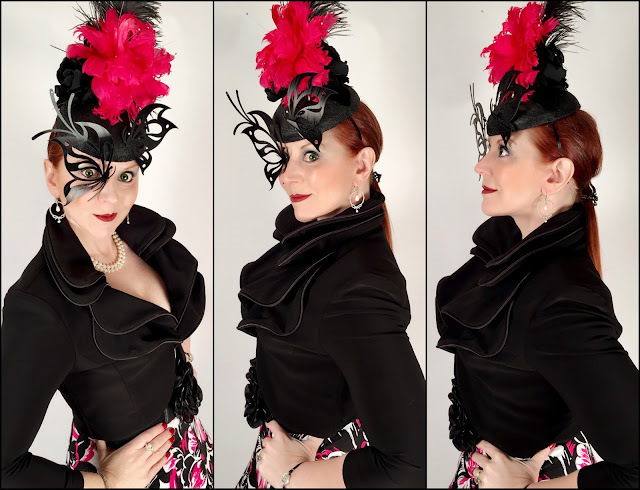 As dramatic as the delicate black winged butterflies are, however, I wanted a bigger statement for Oaks Day (and I also needed pink!) So I went to work with a needle and thread and some very thin wire, attaching a few feather elements and two black velvet millinery roses I'd collected over time. M goal was to create a "custom" headpiece to coordinate with 7 year old dress, but in a way that would allow me to remove the embellishments later and restore the hat to its original form. I am so, so happy with how it turned out! I was a little concerned the vertical elements of the hat wouldn't withstand the weather, but I didn't lose a feather despite the near constant rain. It also withstood the wind and rain beautifully - better than I expected, in fact. The forecast was accurate, and It was by far the wettest, coldest day I've ever spent at the track. Yet, I managed to stay reasonably warm and dry with the addition of the wire-collared bolero jacket (an eBay find a few years ago), topped by a clear raincoat with black seamed details that allowed my ensemble to show through even when I was actually out in the rain. And most importantly, I still had a great time despite the weather. 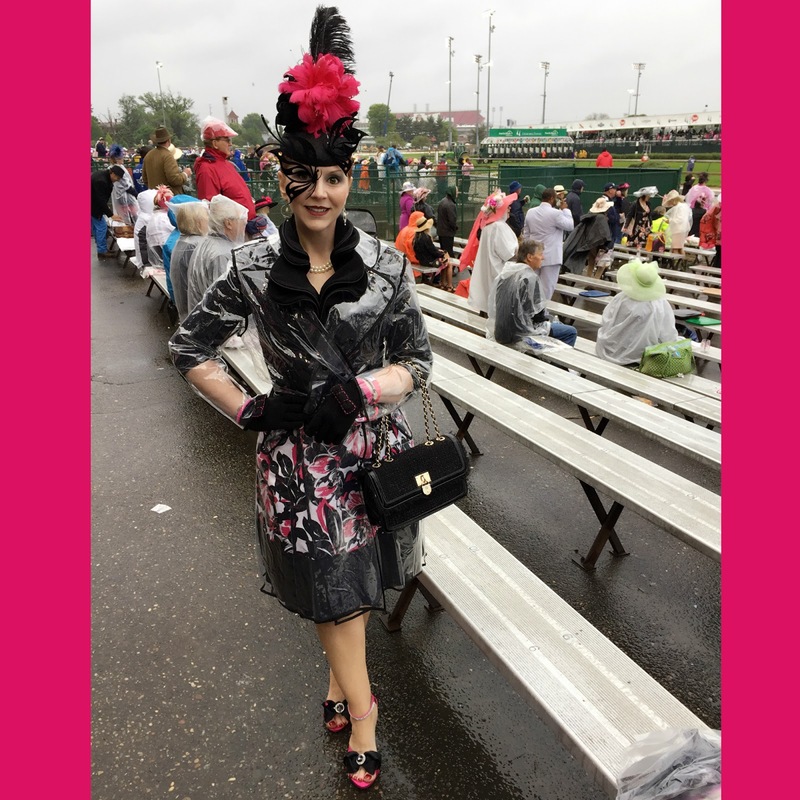 Oaks Day is still my favorite, and the last minute change in outfit means, weather permitting, I already have next year's outfit, too. Fashion is what you buy;Style is what you do with it! I wore the same dress with a traditional, wide-brimmed hat in 2010 (right). You are perched like a beautiful butterfly, standing out among all the other blossoms on your rainy Oaks Day. The laser cut butterflies are so creative, and are perfectly positioned. I am so glad your inspired hat withstood the wet weather, you look lovely! 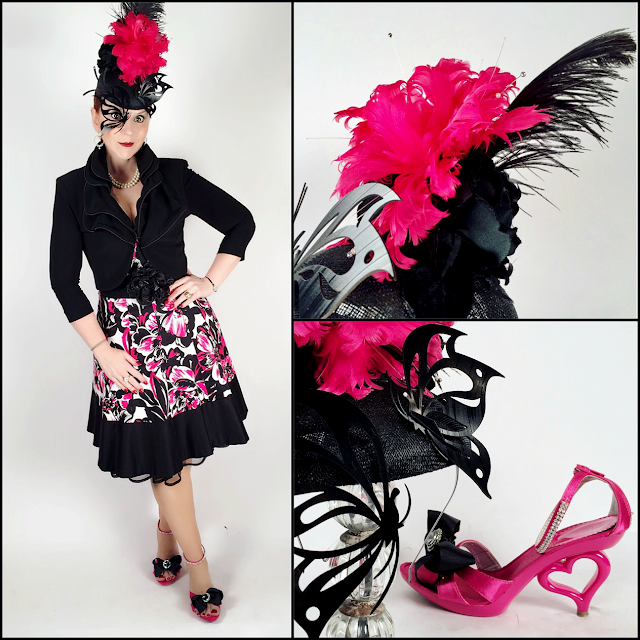 Thank you for sharing your fun and unique style with Hat Attack!